Love it or hate it, vocal tuning or "pitch correction" is a technology that is here to say. And whether or not you feel it is "morally" correct/in-correct to artificially tune vocals and other instruments, it is hard to deny the dramatic influence pitch correction has had on pop music over the last decade. As a long time front-runner in pitch correction technology for Pro Tools, Antares has definitely staked their claim for "most popular plug-in ever" with their classic Auto-Tune software. Now in its six iteration, Auto-Tune EVO has once again raised the bar in pitch correction with a ton of new features and sound enhancements, while still dishing up the infamous "Cher effect" in an instant. 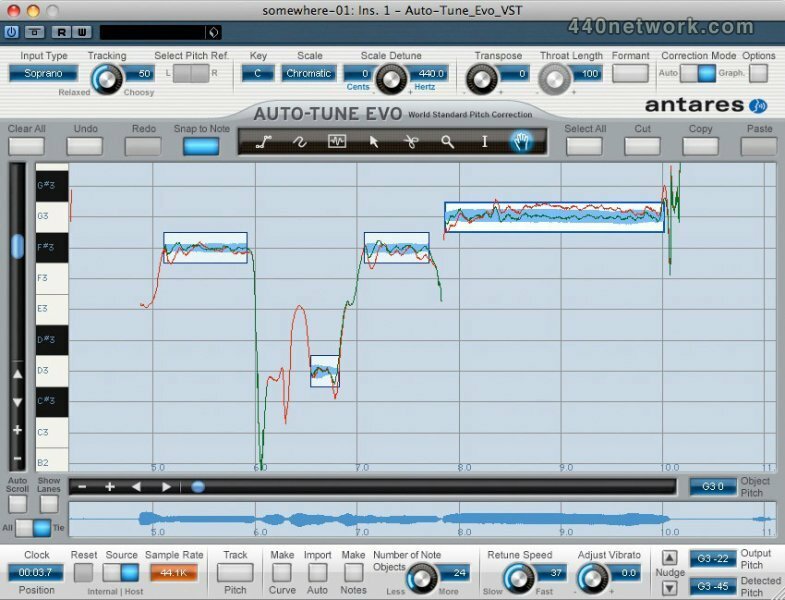 This week at the Pro Tools corner we will test-drive Antares' latest version of Auto-Tune, "EVO," as I walk you through some basic vocal tuning workflows using the plug-in. Before I receive a million emails from Celemony and Wave's fanboys telling me that their vocal tuning workflow is superior, I just want to set the record straight. I am fully aware of and actively use the entire range vocal tuning solutions out there and they are all fabulous in their own ways. Many times I will attempt to tune a certain genre or style of voice with one package and have nothing but trouble, in such cases simply switching to another companies algorithm/tuning-workflow solves the problem. Again I am not here to tell you that Auto-Tune is better than Melodyne is better than Waves Tune, etc. They are all excellent and I use them all regularly. But I will tell you that it is in your best interest to get familiar with as many pitch correction solutions as possible, to best prepare for any situation. I must say Auto-Tune has come a long way since I started using the plug-in in the late 90s, but it continues to be the easiest "automatic" pitch correction plug-in I have ever used. EVO honors that linage with the familiar "automatic" page along with an improved "graphical" editing system and dramatically enhanced core detection and re-pitching engine. EVO also borrows some tricks from the AVOX bundle by adding real time pitch and formant shifting along with throat modeling controls. Users of Auto-Tune 5 will be familiar with the new and even more refined graphic user interface and if it has been awhile since you have used Auto-Tune in graphical mode, you are really missing out on some cool new features like note based pitch correction (ala Melodyne or Waves Tune), the pitch graph, custom keyboard commands and enhanced visual feedback on real-time re-pitching. As a side note, Pro Tools HD users will be happy to know that Auto-Tune EVO still runs as TDM (without some of the newer AVOX functionality like throat modeling, pitch/formant shifting). Have reasonable expectations: I think most people's perception of pitch correction is a bit irrational. Think you can take any karaoke nightmare and turn him/her into a polished pop masterpiece? Think again folks. As amazing as the current suite of pitch correction products are, there are some miracles that cannot yet be achieved. The voice is an extremely complex instrument with subtle nuances and characteristics that we may never fully understand. That being said, if your vocal track has poor phrasing, breath control issues, lack of conviction, bad tone, or "insert one of a million problems other than pitch here," you could be out of luck. I think a lot of producers want to set the record straight on this; bottom line, you still need a reasonably convincing performance before you even think about pitch correction. It's not all in the pitch: Being in time is just as important as being in tune. And while technologies like elastic audio and Melodyne have dramatically improved a producer's ability to re-time or re-groove a performance, there is still only so much phrase tweaking one can perform before things start to sound a little wonky. It takes time: If you have a particularly tricky vocal, or one that is way out of tune, you may need to break down and tune it manually phrase by phrase using Auto-Tunes graphical mode. Doing this correctly can take a significant amount of time, largely depending on the genre music and the complexity of the performance. Plan on having some patience for this task. Be tasteful: Let the esthetic of the song and/or genre be your guide. In many styles of pop music, obvious pitch correction is used as an effect or stylistic treatment (think Akon, or T-Pain "robot" style tuning effects), while in other genres maintaining the original quality of the vocal performance is critical. Remember it is possible to tune a vocal quite naturally, without any audible artifacts if done correctly. So I have isolated a less than stellar solo vocal performance in my session and have started by inserting the Auto-Tune Evo Plug-in (found under the "pitch shift" category). Remember Auto-Tune is designed to pitch correct monophonic sound sources, chords or polyphonic sources will not be detected correctly. While "automatic" should be just that, there are a few parameters you may wish to tweak to get the best tuning results quickly. In this example I am working with a tenor male vocalist who is singing in D Major. I start by setting Auto-Tune's input type to Alto/Tenor, which optimizing its pitch detection algorithm for the specified range of voice/instrument. Next I will set the tracking. Auto-Tune relies on a periodically repeating waveform to detect incoming pitch. Tracking allows you to "loosen" its idea of "periodic" which may be necessary in the case of noisy or poorly recorded sources (i.e. live performances, or very "breathy" sources). For most studio scenarios, the default setting of 50 is just fine, however my specific vocal is in this case exceptionally breathy so I increase it a bit to 70. Because my vocal melody sticks exclusively to the notes within D major I can choose the key and scale explicitly from the scale menu. While chromatic settings can work great, I often find that I get better results by isolating out the notes I never want Auto-Tune to correct to. Remember you can selectively choose which notes Auto-Tune will look for and re-pitch to by bypassing or removing notes in a scale. You can also feed Auto-Tune a real time midi input to manually direct the re-pitching process. Now for the most critical part of the automatic setup, "Retune Speed" and "Humanize." These two settings can dramatically affect the way Auto-Tune sounds, and whether the results are natural or over-the-top. Retune speed controls how fast Auto-Tune will apply its pitch correction to the signal and is measured in milliseconds. Setting the retune speed to zero will cause instantaneous retuning of the signal and result in a Cher or T-Pain-style vocal. Typically settings of 10-50 are optimal for most vocals. I find this parameter is best setup via "trial-and-error" knob twisting, finding a happy medium between a natural sound, pitch accuracy, and average note length. Try adjusting the retune speed so that the shortest notes are in tune, then move on to the humanize control. The humanize control allows Auto-Tune to differentiate between short staccato notes and long sustained ones, usually requiring different retune speeds. If you feel that your sustained notes sound unnaturally static, try increasing the humanize control to slow down the retune speed for sustained notes. Remember to let your ears be your guide. I found a humanize setting of 23 worked for this situation. I finish up by checking the natural vibrato control to modify the modulation depth of the signer's vibrato while maintain the shape and characteristic of the modulation. If the performance contains extreme pitch modulation due to vibrato, enough so for Auto-Tune to think it is the next note higher or lower in the scale you can use the "targeting ignores vibrato" function. As a matter of personal preference I generally use "automatic" mode for quick tuning jobs or during live performances, when manually retuning is not practical/impossible, or when a specific "effect" is desired. More often then not though I will take the track phrase by phrase and manually retune the whole performance or just the worst spots. * Watch out for plug-in delay. In a single RTAS instance, Auto-Tune EVO displayed 2760 samples of delay on my system, If you are using LE/M-Powered or HD with delay compensation disabled, you will have to deal with this unless you want your track to be significantly later in time. Read my previous article on plug-in delay here for some solutions. * Try cutting up your vocal performance into two tracks, one for "no tuning required" and one for "needs correction." Only place the tuning plug-in on the "needs correction" track. Why run something through a tuning plug-in unnecessarily? * You can also use automatic mode to spot tune with audio suite. Just fix the bad spots. * Read the manual and learn how to use graphical mode. Seriously, you really want to do this if you are serious about having ultimate control.